NEW! Primal Fuel is now made without Soy! Possible Winter and Holiday Shipping Delays Please understand that you may experience shipping delays during the winter months due to weather conditions and/or an increase in order volume, due to the holiday season. Please contact us via email at info@primalblueprint.com or call (888)774-6259 Ext. 4110 and a customer service rep will be happy to help check on the status of your order. Q: What is whey protein isolate? Q: What is whey protein isolate? A: Whey protein isolate, the primary source of protein in Primal Fuel, is the gold standard in protein powders because it has the highest bioavailability of any form of protein. This means that it’s one of the easiest types of protein for your body to use. It is derived from milk but retains very little lactose or casein proteins, which makes it easier to tolerate than other dairy supplements. So, it is derived from dairy, but it is basically without casein. If people have difficulty digesting dairy, it is typically because of the casein content. 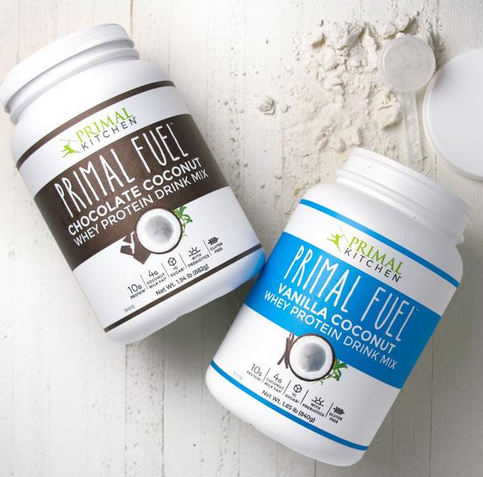 Our Primal Fuel is the only protein on the market that derives its fat from coconut milk powder, which provides a quality, natural fat source. The formula is grain free, which is important to us at Primal, as we believe a grain- and legume-free diet is the most appropriate diet for our genetic disposition. Finally, our protein powder contains inulin from chicory root, which functions as a prebiotic that helps support beneficial bacterial growth in the digestive system. Obviously, if your goal is to be a raw foodist our protein does not fall within this framework. It really comes down to your belief system as to what type of diet is the best for your genetic expression. Our philosophy is founded on the principles of ancestral health and the idea that our bodies thrive on a diet most closely related to that of our Primal ancestors. Q: Is the whey from grass-fed cows? A: Grass-fed animal fat is better. Grass-fed meat is better. Grass-fed dairy is definitely better. But grass-fed whey isolate? It's actually unnecessary. Why? Well, let’s look at the commonly cited reasons for preferring grass-fed animal products to grain-fed animal products. Grass-fed has better fatty acids, more omega-3, and more CLA. Whey isolate contains almost zero fat. Grass-fed has a better micronutrient profile, more minerals, and more vitamins. Whey isolate contains neither minerals nor vitamins. Grass-fed has a better taste. Some say it’s “gamey.” Whey isolate has no flavor, so “better” doesn’t enter the equation. When you don't keep the fat in your protein powder, it makes no difference if the cows from which it comes are grass-fed or not. Grass feeding only affects fat profile, not protein content or amino acid profile. Grass-fed's benefits are mostly in the fats and WPI (whey) has very low fat (it's supposed to be a source of protein), so it’s not really cost effective to source the whey from grass-fed cows. Grass-fed whey protein isolate comes at quite a premium, so we feel that it is most cost-effective for our consumers not to choose this. Q: What is the amino acid breakdown? Q: Where does the fat come from? A: Our fat comes from coconut milk powder, a natural fat source also providing medium chain triglycerides. Q: Is there lactose in this product? A: We use whey protein isolate which contains trace amounts of lactose, so the extremely intolerant may have problems digesting it properly. Q: What if I am dairy intolerant? A: Because whey is, by definition, the stuff that separates from the casein when it curdles, it has very little casein (save for trace amounts), rarely enough to be noticeable to anyone but the most casein-intolerant. But that’s pure whey; whey protein isolate powder has very little casein. A: Prebiotics are basically a food source for the good bacteria that inhabit your gut. Prebiotics encourage these good bacteria to survive and thrive. Primal Fuel prebiotics comes in the form of all-natural soluble chicory fiber. Q: For how long does Primal Fuel curb hunger? A: One Primal Fuel shake can curb hunger for a few hours after consumption, but it really depends on your own metabolism and lifestyle. It’s not meant to replace a meal (you still need to eat a balanced diet to achieve optimal health and weight loss), but it curbs hunger without adding lots of calories, which makes you more likely to eat responsibly at other meals. Q: What are the "natural flavors" made of? A: Our natural flavors are true to their name. They’re a proprietary blend of natural substances including vanilla and chocolate flavors to make the best overall flavor experience possible—nothing tricky or artificial! Q: How much phosphorus does Primal Fuel contain? Q: I have an allergy, are the fuels manufactured in a facility that contains dairy, eggs, or nuts? A: Yes, our fuels are manufactured in a shared facility that may also process ingredients containing milk, eggs, fish, shellfish, tree nuts, peanuts, wheat, and soybeans. While they do practice safe cleaning procedures in-between runs, including allergen swabbing, we still recommend caution if there is a zero tolerance. Allergens in product consist of Milk and Tree Nuts (coconut). Q: What is your filtration process? A: Our microfiltration produces all natural protein powder without added chemicals. There are differences between whey protein isolate and whey protein concentrate. Whey protein isolate has a higher protein content and is slightly lower in carbohydrates, lactose, and fat. But it is typically more expensive due to the additional manufacturing process it undergoes. Microfiltration techniques use low temperatures to allow production of high protein content (>90%), retention of important sub-fractions, extremely low fat and lactose contents, and virtually no undenatured proteins. Q: Is Primal Fuel screened for heavy metals? A: The testing of our fuel product ensures it is within the specification of all major heavy metals including arsenic, lead, mercury, and cadmium. Our products adhere to the strict standards of California’s Proposition 65, which are more stringent than federal standards. Q: How often should I consume Primal Fuel? A: Many people use Primal Fuel as part of a breakfast shake to start the day. Others use it as a quick primal-friendly snack when better snack choices are unavailable or unappealing. It’s not meant to replace a meal (you still need to eat a balanced diet to achieve optimal health and weight loss), but it curbs hunger without adding lots of calories, which makes you more likely to eat responsibly at other meals. Some find it's a great way to add more protein and natural fats to an existing small meal. So the frequency in which you use it will depend on your personal choice. A: The shelf life would be no less than 9 months from being opened. Each canister has an expiration date printed on the bottom package. Please store in a cool, dry place, tightly sealed. Q: What are Steviol Glycosides and why did we add them into the formula? Steviol glycosides are simply stevia leaf extract. This is a new naming convention required by FDA, but represents the same natural non-caloric sweetener we’ve used historically in our Primal Fuel. They provide a pleasant sweetness, combined with monk fruit extract, without adding sugar. Q: Are Steviol Glycosides allowed on the SCD or AIP diet? A: It is recommended that you check with your healthcare provider about what is best for your personal dietary plan. There are mixed opinions on whether these are allowed for each diet, but it comes down to personal tolerance. Q: What is monk fruit extract? This is a non-caloric natural sweetener derived from the monk fruit (also known as luo han guo). It is native to Asia, and provides a pleasant sweetness, combined with steviol glycosides, without adding sugar. Q: Has your cacao powder been tested for its lead content? If so, how much is in it? A: The testing of our products ensures they are within the regulatory requirements, including the stringent California Prop 65 specifications. This includes all major heavy metals (arsenic, lead, mercury, and cadmium). Heavy metal content of the cacao as an ingredient will vary from lot to lot, and must be within the specification before it is used, but what is most important is the lead content of the overall Primal Fuel product, which is always within the Prop 65 specifications. These are 20x more stringent for lead content than federal standards. Q: The Chocolate Primal Fuel contains cocoa powder -- does that mean there is caffeine? A: A tablespoon of cocoa powder has about 12 milligrams of caffeine - not much, but it can affect an individual who is sensitive to caffeine. A serving of Primal Fuel has even less than a tablespoon of cocoa powder, however, if small amounts of caffeine keep you awake, you may want to have your shakes earlier in the day, or choose the Vanilla Fuel instead.